Manchester United gained their best pre-season victory so far by beating Barcelona 3-1 in front of 68,414 at Levi's Stadium in Santa Clara, California. 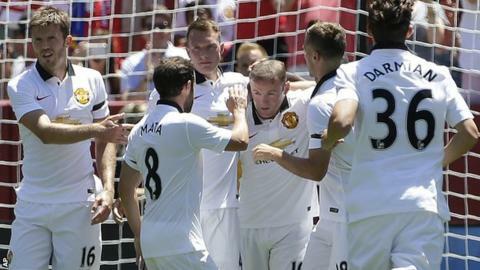 Wayne Rooney's eighth-minute header from Ashley Young's corner put United in front. Jesse Lingard doubled the lead when he swept home Tyler Blackett's cross after Louis van Gaal had replaced his entire starting XI just past the hour mark. Rafinha's splendid volley in the final minute was followed almost immediately by United's third from Adnan Januzaj as Van Gaal's team struck on the break. Victory over the European champions is a welcome sign of progress for Van Gaal - particularly in attack - although Barcelona did hit the woodwork on three occasions, twice through Luis Suarez, who also had a goal disallowed for offside. United, who have a 100% record from their three US tour games, have only one match of their pre-season campaign remaining, against Paris St-Germain in Chicago on 29 July. Van Gaal said on Friday his starting line-up to face Barcelona would be a pointer to the side he intends to select for the opening Premier League game against Tottenham on 8 August. However, a minor injury kept out Germany midfielder Bastian Schweinsteiger and defender Marcos Rojo was also missing after a late return from Copa America duty with Argentina - plus there is the potential for additional personnel being signed in the next fortnight. But there were still some surprises. Netherlands international Daley Blind is ahead of Chris Smalling in the central defensive pecking order. Memphis Depay has been picked as a number 10 behind captain Wayne Rooney rather than in the wider role it was anticipated he would occupy following his £31m arrival from PSV Eindhoven. And then there is Ashley Young. The 30-year-old winger is out of contract next summer and there has been no suggestion his deal will be renewed. But with record signing Angel Di Maria's future uncertain, Young has a chance to build on last season, when he was one of United's most consistent performers. He impressed against Barca, cutting in from the left flank and darting across their defence. Had it not been for the strong hands of goalkeeper Marc-Andre ter Stegen, Young could easily have got the goal his incisiveness deserved. How are the new boys settling in? Depay is the most notable presence of the £80m plus that United have spent on their four new signings this summer. Quick and direct, it is clear the Netherlands international has an eye for goal and is maybe a touch too selfish at times - but he looks to be one of those players who has the knack of making things happen. He led Gerard Pique a merry dance at the start of the second half as he threatened a second goal. Of equal importance, the 21-year-old's link-up play with Rooney has been good. Both have scored on tour following Rooney's header against Barcelona and United can feel confident about posing a more potent threat domestically than they did last season. Of the rest, Morgan Schneiderlin is more quietly efficient than eye-catching. The France international lacks experience at the highest level and there were times at the Levi's Stadium when Barcelona played around him rather too easily. Improvement will come though, especially with Michael Carrick's experience cajoling him into the right positions. Van Gaal surprised observers by saying Matteo Darmian was behind Antonio Valencia at right-back given the £12.8m newcomer is a current Italy international and the Ecuadorian is a makeshift in the role. But there are clearly a few rough edges to smooth given the regularity with which Darmian drove forward down the wing without checking if there was adequate cover. The merits of Bastian Schweinsteiger have still to be seen. The Germany midfielder was "bad" against San Jose Earthquakes, according to Van Gaal. He missed out against Barca with a minor injury. If United looked good in attack, they wobbled at the back. In one sense, the much-talked-about attempt to sign Sergio Ramos from Real Madrid highlights a glaring problem in central defence. Yet if it came at the cost of David De Gea, it would rob United of one of their key men. De Gea stood out against Barcelona. His early save from Sergi Roberto set the tone for another assured performance. Nonetheless, Barca, without Lionel Messi and Neymar, were able to exploit the space between Blind and Phil Jones and the midfielders who were supposed to be screening them. Faults evidently exist that the return of Rojo cannot be guaranteed to fix. It leaves Van Gaal in a tricky position. Stick with De Gea and let his contract run down or push for Ramos knowing any replacement goalkeeper - Ajax's Jasper Cillessen is the favoured candidate - may not measure up to his predecessor. As promised, Van Gaal changed his entire starting XI shortly after the hour mark. Schweinsteiger's injury meant a first pre-season appearance for Marouane Fellaini, who is suspended for United's opening three games. Valencia also played for the first time this pre-season. Jonny Evans, who is expected to leave Old Trafford before the transfer window closes, was not used as Paddy McNair partnered Chris Smalling in central defence in the re-jigged formation. The second string could be forgiven an element of disenchantment at being made to feel bit-part figures. But some of the younger players in particular have work to do if they are to secure a place in Van Gaal's plans for the new campaign. To that end, England Under-21 international Lingard, who has already had four loan moves, picked a good time to announce his intentions by scoring United's second shortly after his introduction. Januzaj, who looked so good under David Moyes only for his performances to lapse markedly last season, also needs to catch the eye and after striking the side netting, the 20-year-old got his goal in stoppage time.